Ever since the early Pentecostal move broke out people have been pushing back boundaries. The ministries of apostle and prophet were rediscovered in the later apostolic movement. Jessie Penn Lewis as a "father level" individual in God's 20th Century Move cannot possibly be overstated yet apart from her books , precious little is known widely. 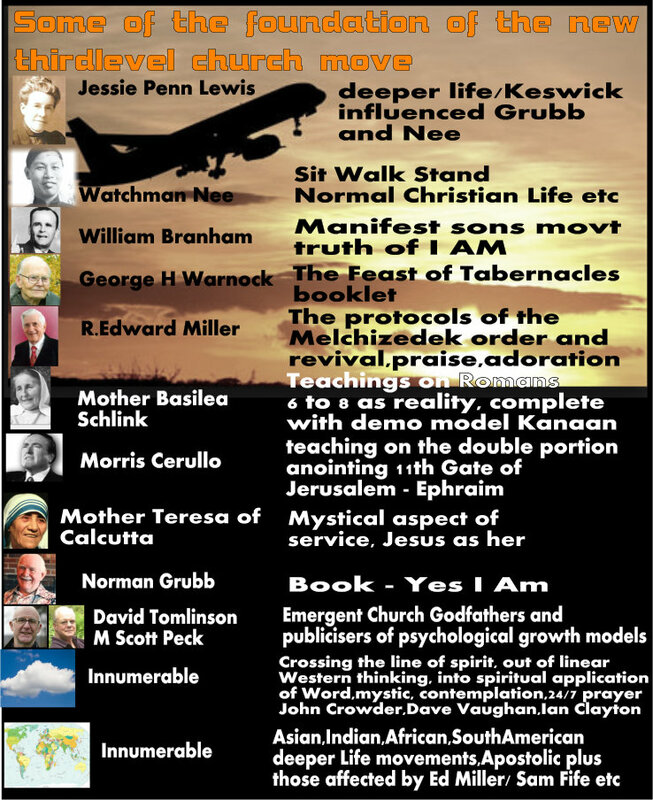 But she really affected Norman Grubb, and her writings really influenced Watchman Nee. Ofcourse we have to thank hundreds and thousands of greater and lesser known pentecostal pioneers for literally laying hold of heaven's power in an increasingly atheistic and warlike age....but i wanted to highlight those who were pushing things towards the thirdlevel. I could have included Sam Fife who fathered the huge early prototypes of thirdlevel church, but if you read online you will hear of many many bad bad outcomes of these early pioneers. William Branham is often described as going off the rails....but i heard the other week that the CIA made huge claims about drink problems. Anybody who starts to "get" the internal world of Galatians 2:20 immediately "crosses" the Spirit boundary much ridiculed by a world totally trapped in the tyranny of the leftbrain. Power doesn't reside in the leftbrain, so if you want to do exploits for God you HAVE to move into other parts of you....and this is why the Spirit has been outpoured, to teach us and lead us in these things. Why Morris Cerullo? Many teach baptism in the Spirit. Some teach baptism in the Spirit and fire. But Morris was raised up to begin teaching on what he calls the New Anointing. In the pictorial form of Jerusalem's Gates this connects with the double portion anointing of the Gate of Ephraim the 11th Gate. Anointing on its own isn't enough. But in the Holiest Place we see a Mercy Seat stacked out with three aspects of Word, and IN THAT PRECISE CONTEXT of Galatians 2:20 living is the most incredible experience of Shekinah glory anointing overhead that the CHURCH has never really come into.....YET!!!!! Why Mother Teresa? Well loads do charity works. But SHE WAITED ON GOD for decades, then in the context of Jesus living her life as her....she was commissioned to do charity work as few have done....actively eating Christ every morning in the form of the Eucharist and living out from that on the streets among the dying and homeless. This is a whole different level of Christ reaching out through the church. ENJOY perusing. I'd love to know what you think?